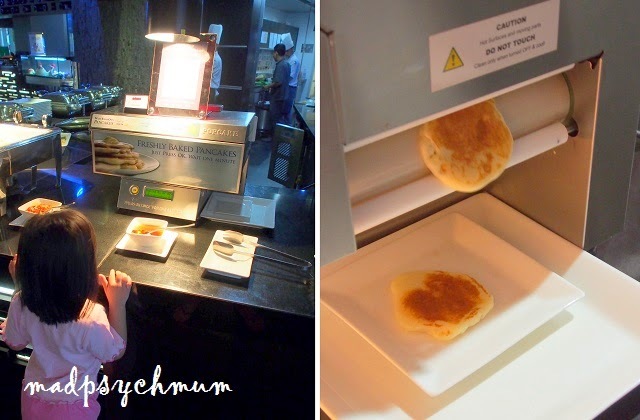 We went for breakfast at Mezza restaurant. After a lovely breakfast of fresh pancakes and eggs, we travelled to Union Mall (recommended by a friend, who says it's better than Platinum Mall) for some shopping! 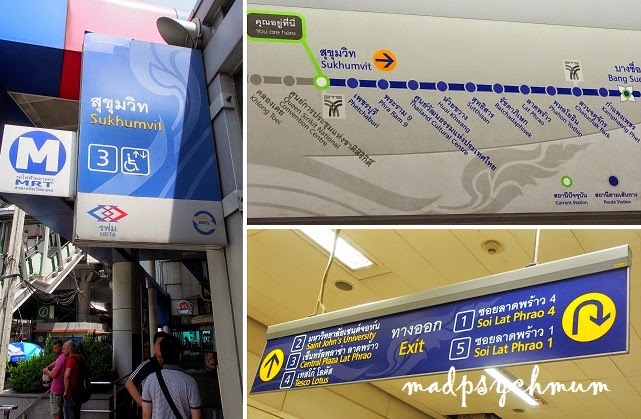 To get to Union Mall, take the Bangkok Metro (MRT) from Sukhumvit Station to Phahon Yothin Station. The journey cost us about 30 baht each and took approximately 30 minutes. Looks like Platinum Mall but a lot cheaper! Mum in law bought a number of tops and was super happy with her purchase. No nursing room in sight so I fed Baby Boy for the first time in the carrier under the nursing cover while walking around! 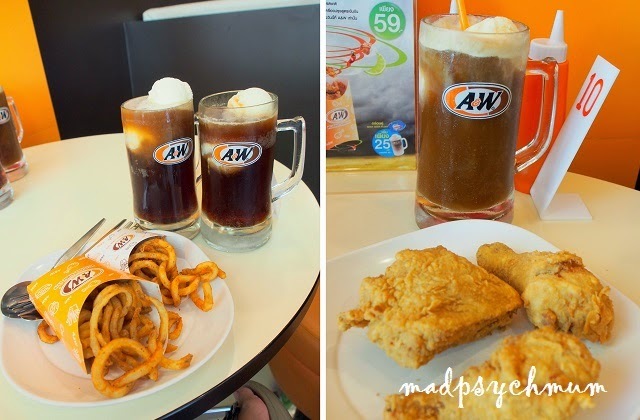 I was literally jumping for joy when I saw a familiar sight that is no longer available in Singapore: A&W! 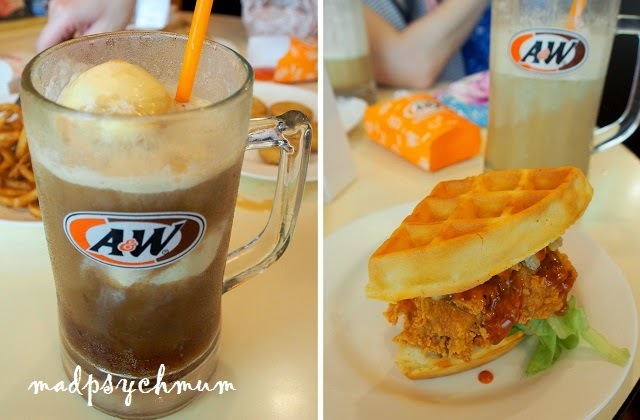 Left: The hubby added one more scoup of ice-cream to our root beer float! Crazily good! We shopped for a bit more before returning to the hotel for canapé again (the family loved the free flow alcohol and food, plus I wasn't feeling well so we decided not to chiong). We were very happy to be greeted with a baby cot in my Mum-in-law's room! All the cots were occupied the day before so my girl had to squeeze with my Mum-in-law and Brother-in-law in a king size bed. They both complained that she kicked them the whole night! Since my girl could fit nicely into the cot, we decided to let her sleep in it instead of my boy so that my in-laws can sleep in peace (they did indeed sleep very well that night, thanks to the cot!). After our canapé, we headed for pedicures and massages for the girls and guys respectively. Perhaps because we asked for my girl's pedicure to be done for free, my pedicure was done very shabbily. 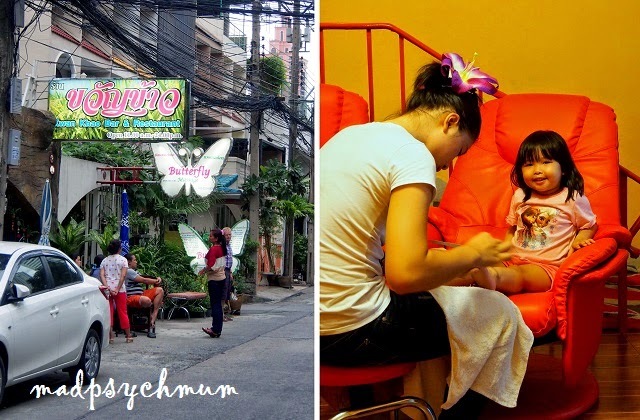 Having been used to great nail services in Singapore, I was really unhappy with the terrible service and workmanship. I saw how much the guys were enjoying their massages so I decided to get massages as well! The hour-long foot massage was awesome and well worth the money! Although they call it a foot massage, the masseuse massages your feet, legs, arms, hands, head, neck and even your back! It was almost a full-body massage (the only body part that was not massaged was the chest). 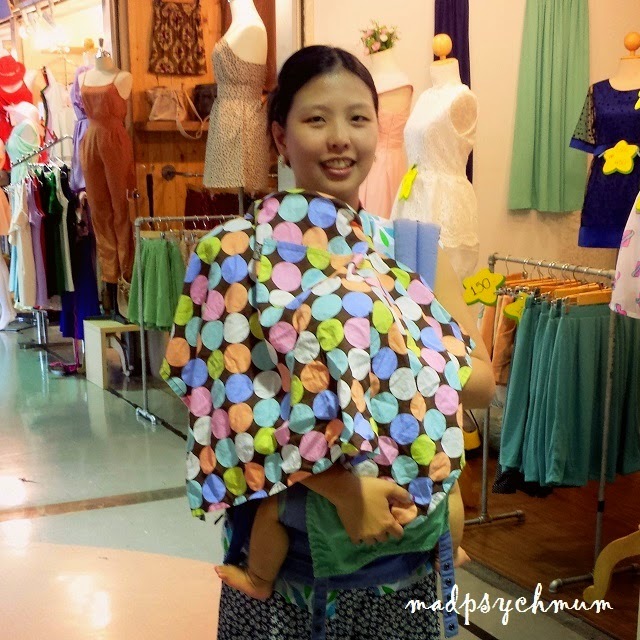 At 200 baht, it was very value for money! By the time I was done with my massage, we had dinner at Palm@18 once again because we liked it so much. 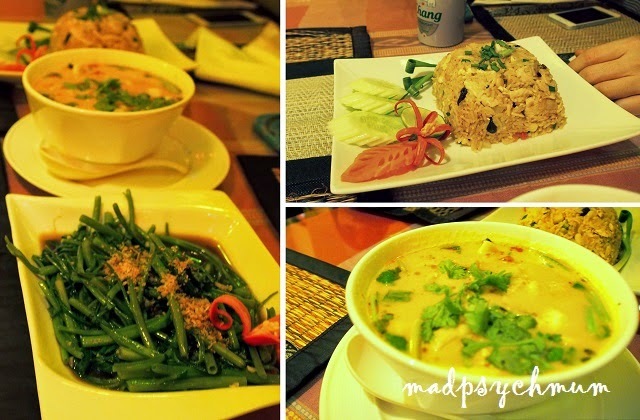 We ordered slightly different dishes and still enjoyed them.